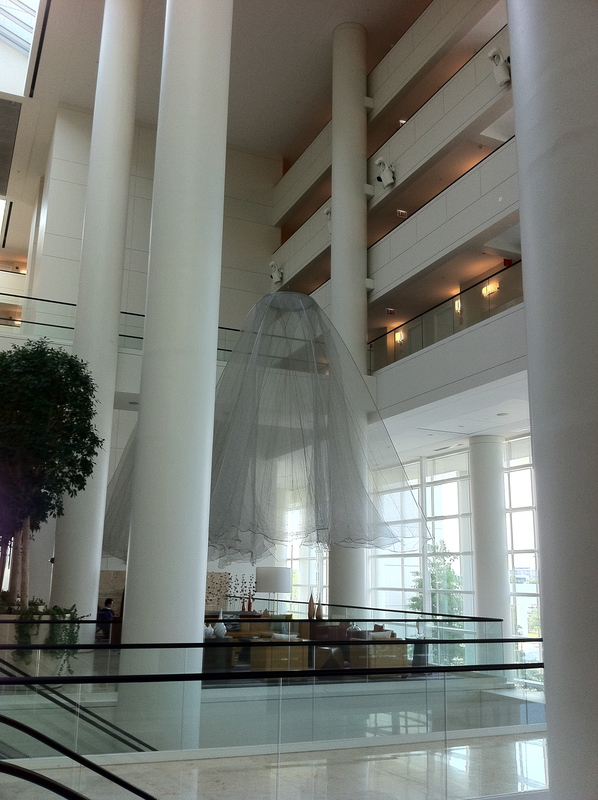 I love hotel lobbies because they definitely set the tone for your selected home-away-from-home. I’ve walked my way through the grandest of the grand and through the dowdiest of dumps. From the sleekest of sleek to ornate design of centuries gone by. 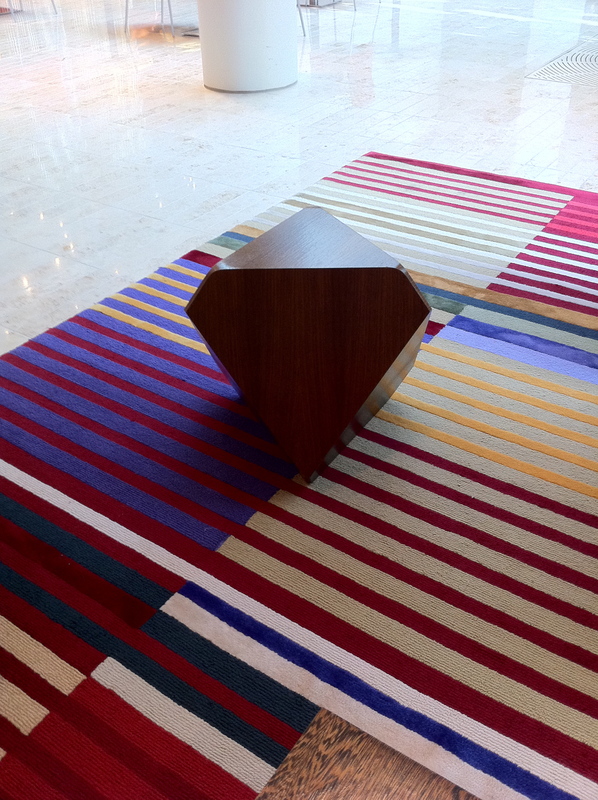 From the boldest and most colorful palettes to the monochromatic tones of understated simplicity. 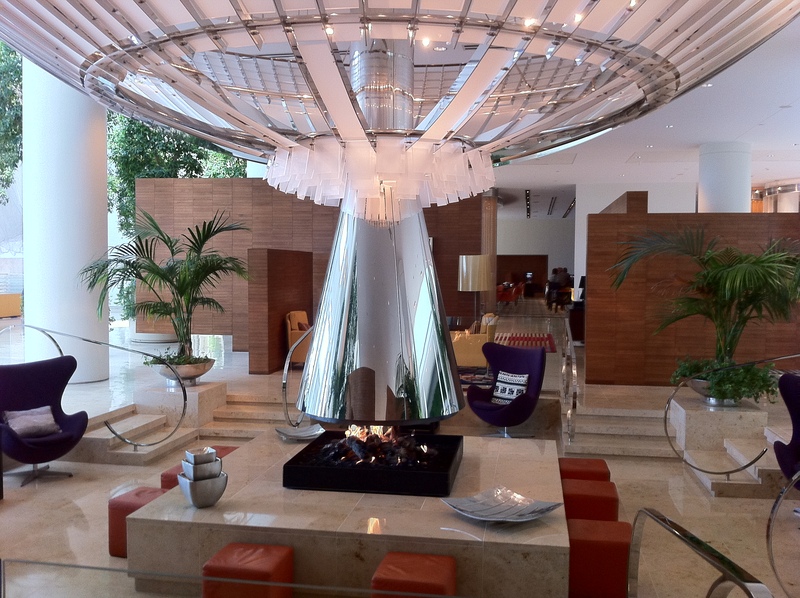 The pictures below are in the dezine of modern contemporary with the biggest statement radiating from the magnificent fireplace and architectural chimney fixture over head. Mix in bold artistic pieces draped from the ceiling, to free-standing wood-paneled walls and beaded-flowing walls that define spaces, there’s something around every corner of this hotel lobby to admire. 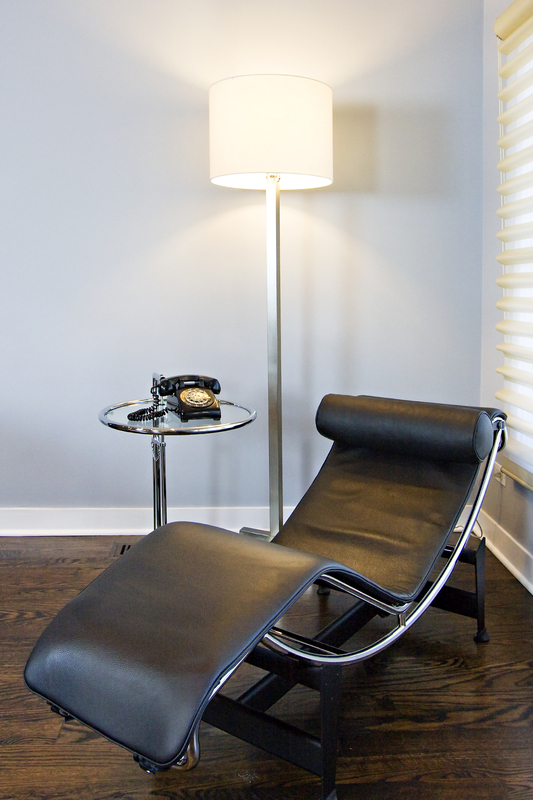 Nestled in the corner of the living sits my favorite piece of furniture, a Le Corbusier chaise reproduction from European Furniture Warehouse, paired nicely with an Eileen Gray steel and glass table and a drum-shade floor lamp, both from Room and Board. I finished the vignette with a garage sale find — a simple black telephone, complete with rotary dial. It was only $5 and I had to have it. It’s a wonderful spot to relax and gaze out the window or enjoy the latest news with my handy iPad. Ever since I saw this chaise in a magazine years ago, I knew I had to have it for that “perfect corner” in the house. What makes it a fantastic piece of furniture is the timeless, yet modern quality in the simple, curving dezine that was born during the 1920s. The same holds true for the Eileen Gray end table inspired by the original from the 1920s — glass and steel, just the right amount of sparkle and timeless. 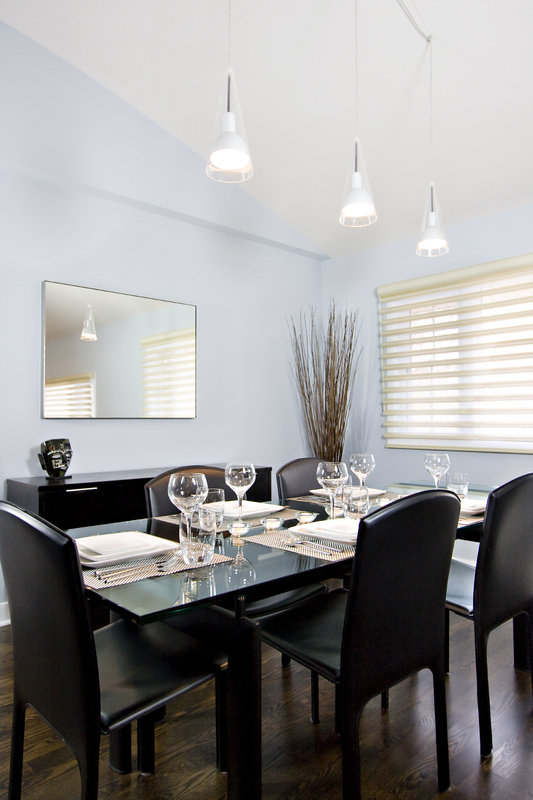 I am fortunate enough to have a properly defined dining room but without the traditional four walls closing it in. The space opens itself up onto the living room on one side, but there are two steps leading down to it with a railing that adds additional separation without closing in the room. Three glass pendant lights hover over the length of the table and can be dimmed as needed. Above — The glass and steel-base table is a Le Corbusier adaptation I picked up from European Furniture Warehouse in Chicago. I flanked it with 6 leather chairs, also from European Furniture Warehouse. For additional seating, I added a black leather and steel bench from Room and Board (see photo below). Below — the sideboard on the right is actually something I discovered in a garage sale in the neighborhood and which I had stained to a rich chocolate color and had new pulls added. 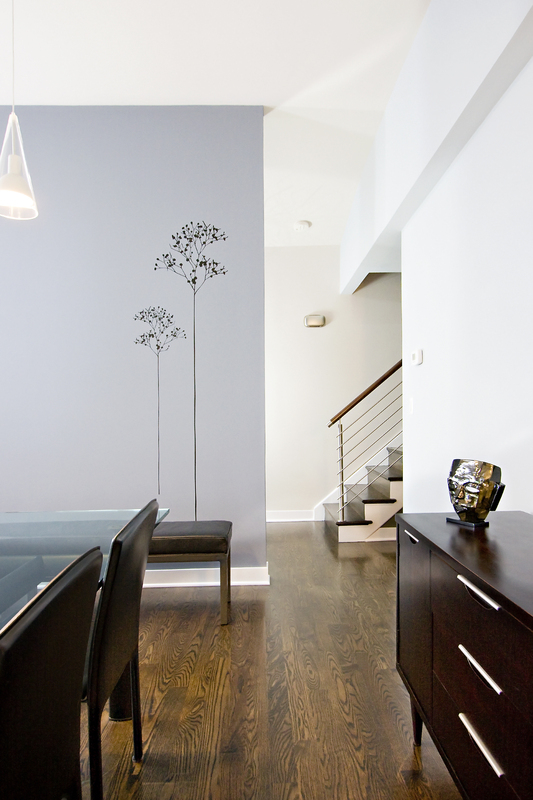 I added “tree” decals to the feature wall to add a touch of whimsy. Photography by Audrey Photo Design. I know, they’re just stairs — a means of moving from one level to another within your home. 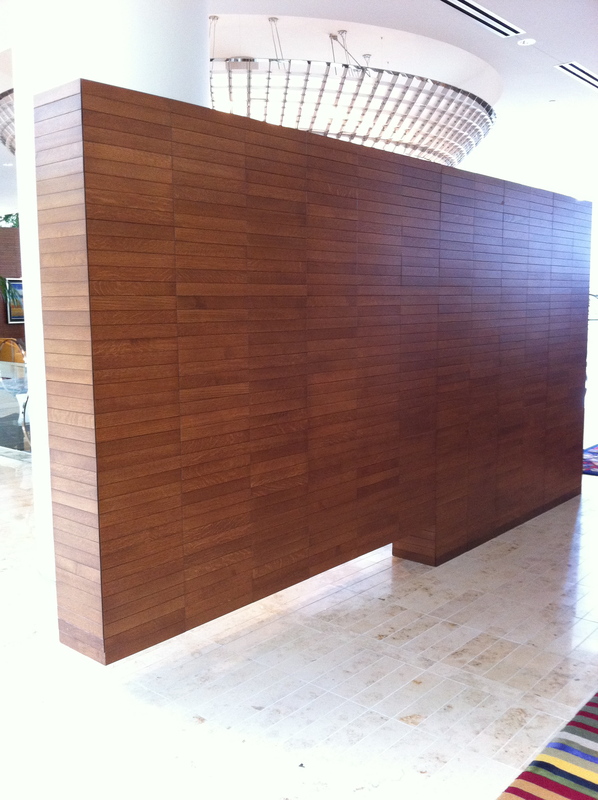 But as part of any home remodel and something so visible to your guests, it’s an area you can’t neglect. From the onset, the dezine vision was pretty clear — remove the carpet, change the rail because it looked too much like outdoor iron gates and change the steps and risers to hardwood, stained in dark espresso. Simple right? Not so much when modern/contemporary is the style. 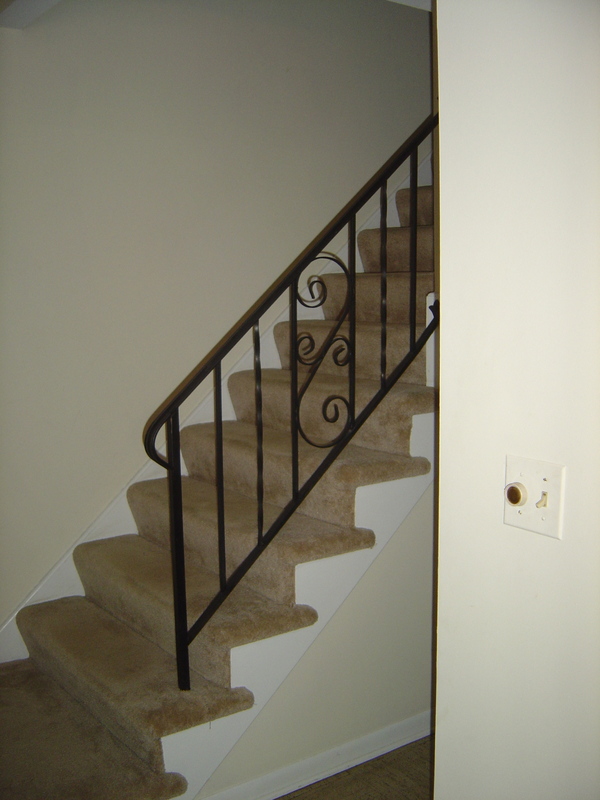 Do you know how hard it is to source modern stair rails? 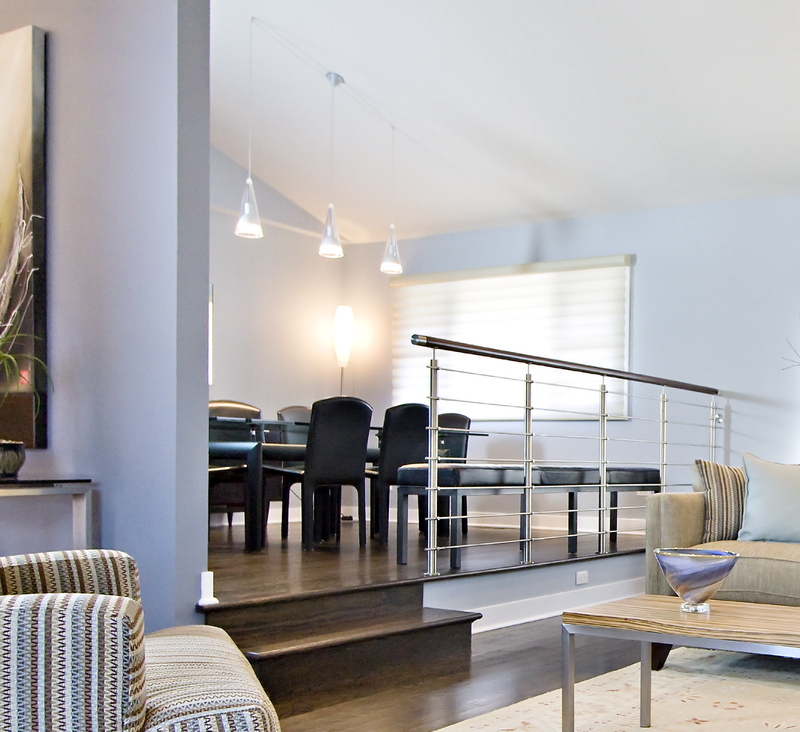 After a long search, I was able to find a local supplier that sold customized modern railings. 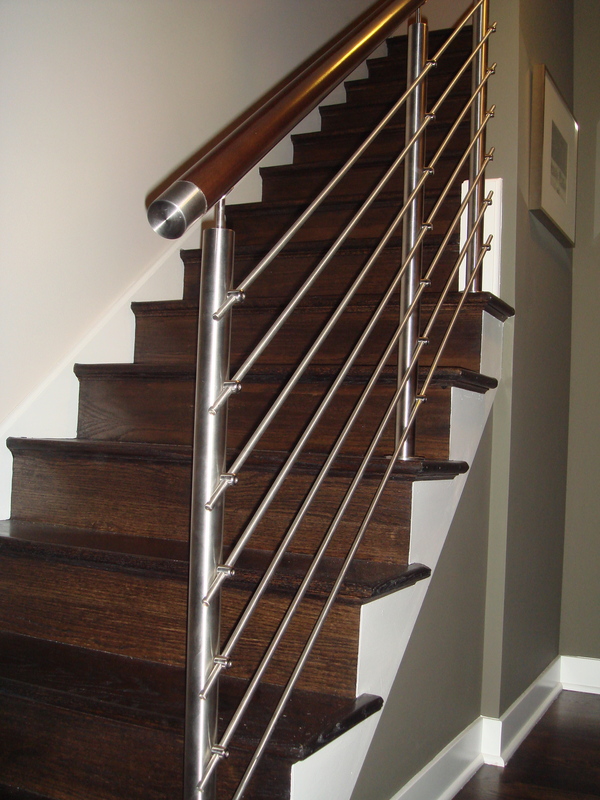 I love stainless steel and wanted to combine it with wood handrails that coordinated with the espresso, hardwood floors. The result? I’ll let you judge for yourself, but I think it turned out pretty nice! Every great city has a green and open space set amidst the chaos and hustle and bustle. In New York, there’s Central Park, in Boston, there’s Boston Common and for Chicago, there’s Millennium Park — carved out between sky scrapers that hug the lake shore and constructed over a railroad system that helped transform Chicago into the city it is today. 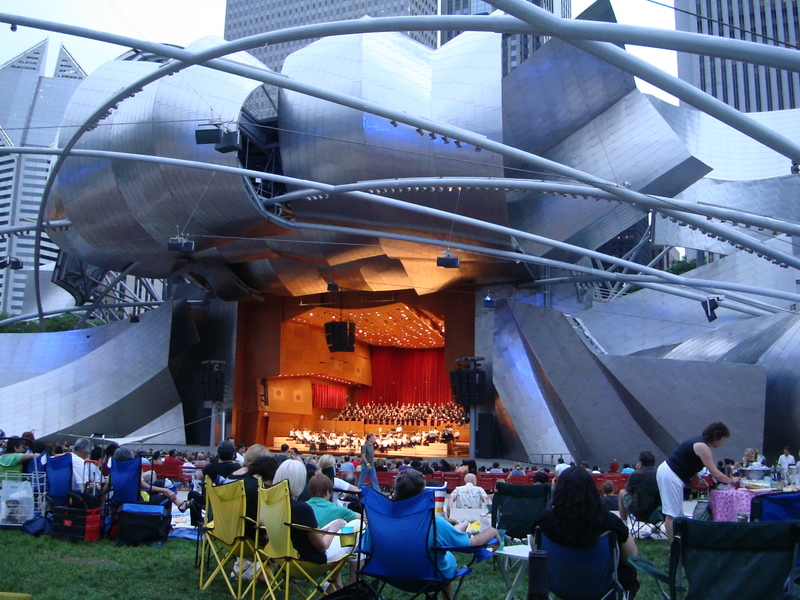 There are so many different aspects of Millennium Park, but on one beautiful summer night, I had the chance to experience the beauty of the Jay Pritzker Pavilion, an open-air concert venue designed by architect Frank Gehry. It’s a massive structure composed of undulating pieces of stainless steel almost mimicking ribbons gently curled at the ends and billowing in the wind. From the main venue, a stainless steel trellis extends over a fixed seating area and beyond into the great lawn with a sound system overhead that generates acoustics as if you were actually inside a concert hall. On this particular night, we dined on the great lawn with our picnic table and chairs and watched the sun set behind the column of skyscrapers surrounding the park. I can’t recall what the orchestra played that night, but being in the midst of the city in this open-air venue was an experience all its own. I stumbled upon this Duravit toilet, www.duravit.com at a local kitchen and bath showroom and I had to get it. I had never seen anything like it and this was after having already remodeled two other bathrooms within the house and countless hours of scouring catalogs and the web for toilets. But I digress because my starting point in this bathroom was actually the vanity. I like putting in vanities that look more like furniture than traditional units you see in the big box stores. And since this guest bath is tiny, I had to find a vanity that was to scale. Dark wood tone with a square, white sink and a single lever faucet — simple and modern. And since you also need storage in a guest room, it had plenty. 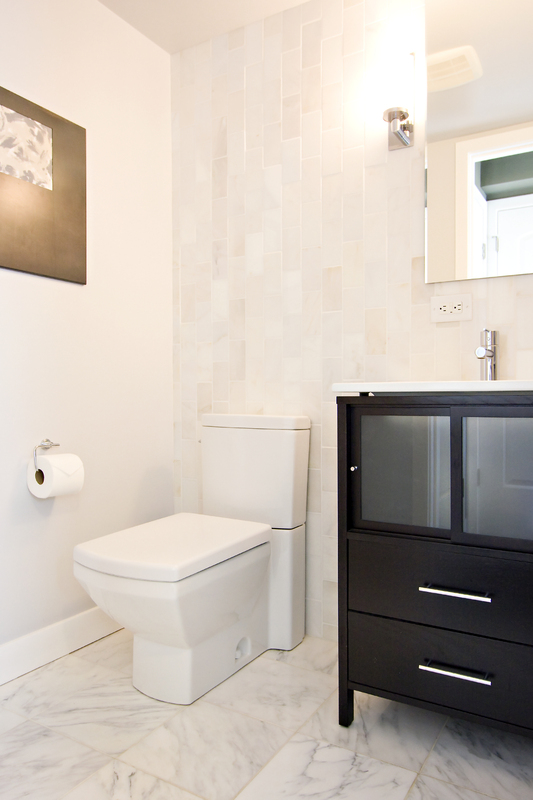 With the vanity selected and its square sink, the toilet was a match made in heaven. I also picked out a tall, rectangular mirror that adds height and flanked it with two polished chrome sconces. Another trick up my sleeve is that the subway tile I selected, pale hues of white/blue-gray/creamy browns, was laid out vertically to add the perception of height in the room, vs. the traditional horizontal pattern. I actually laid every tile out in another room in the exact pattern I wanted to ensure the colors were spread out evenly. The larger tiles on the floor consisted of gray veined marble to pick up the blue-gray in the the wall tiles. And finally, the walls and ceilings are painted a frosty blue-gray to pick up the tones in the wall tile. I love the way this guest bath turned out! Photography by Audrey de la Cruz of Audrey Photo Design, www.audreyphotodesign.com.